However, this simply isn’t an option for success in the corporate world. Negotiations are part of the executive job description, and how good you are at them ultimately determines the future of the company you represent. Negotiating is not easy – especially when there are thousands of pounds on the line. The pressure can be immense. But, when people become good at negotiating, I’ve witnessed many times initial fears of the process turn to relish. Negotiating is exciting, and, when you know how to do it well, it can not only be one of the most profitable skills that you can start bringing to the table, but one of your most fulfilling roles in your company. There’s a lot of psychology that goes into becoming a good negotiator, and a lot of thinking on your feet. Fortune nearly always favours the best-prepared, however, so here are my 10 top negotiating tips that should help give you the edge over your opponent the next time you come to do battle. Knowledge, as ever, is power. If you turn up to negotiate and don’t have the facts, then you’re on the back foot before you’ve even begun. Importantly, doing your homework doesn’t just mean knowing the ins and outs of your own company and its goals, but also of your combatant’s. Are they even in a position to offer what you want from them – and are you in a position to furnish their most likely demands? Doing your homework also means defining your purpose, and are clear in your mind exactly what you ultimately want to achieve from the discussion. You must prepare your questions, and prepare answers to likely questions that will be fired at you. If you fail to do any of these things, then you run the risk of waffling in a vain effort to try and conceal the fact you are essentially unprepared. If this happens, then you hand the advantage across the table, you will not be taken seriously, and will not be able to strike the best deal – indeed, through your embarrassment, you will become more susceptible to accepting a lower offer as you lose confidence in yourself. Be prepared – it’s the only way. A proactive approach to your negotiations puts you in charge of the meeting. Be the first to get down to business and from there you will set the tone and shape the things to come. Some people think that it’s best to wait for your opponent to make the first offer, but studies have shown that you’re more likely to come out ahead if you take the initiative yourself. If you’ve done your homework, then you will know the bargaining power of your combatant, and will have aligned your desired goals with a realistic outcome. As part of taking the initiative, it’s good practice to use a process called “anchoring”, which will let your counter-party know the starting point of all negotiations. As humans, we often rely very heavily on the very first piece of information that is presented to us, which then affects all subsequent decisions. When we go to buy a new car, for instance, the price tag displayed on the window is essentially the salesperson’s anchor offer. If we manage to negotiate a thousand pounds off the price, then we think we’ve got a good deal – where in fact the car was probably only worth what we ended up paying in the first place. So, drop anchor early in the meeting over the top of what you would like the outcome to be – and allow your opponent to bring you down a little to match what you actually expect. Another cunning psychological weapon at your disposal in the negotiating room is the “broken record” ploy. Essentially, this involves repeating your position so many times that the proposition becomes more credible, and can in fact lead to it forming as the only option available to the opposing party. Don’t be in a hurry to get the meeting over with. For one thing, this just gives an amateurish impression – that you’re not taking the proceedings seriously. But, more importantly, you risk leaving serious money on the table unless you stick around to hear all the options. Take your time – indeed, whichever party has more flexibility with time has the advantage. If you’ve got more time to get what you want, then your counter-party may be forced to accept a higher offer if they’ve got somewhere “better” to be. Many negotiators think that in order to prove their prominence the conversation has to be a one-way street. They’re wrong. Good negotiators should act like detectives in an interview room. You need to ask a series of probing questions, and then keep quiet and listen to what’s being said. Your combatant will tell you everything you need to know about how you can strike the best deal for yourself if you allow them the opportunity to spit it out. Be patient, and you’ll get a better understanding not only of the deal at hand, but who you’re going to be working with, what their position is and commitments are. Never lose your ability to say “no”. If you depend too much on a positive outcome, then you are handing the power to the counter-party. Indeed, not all negotiations that end up with no deal being struck are failures. If you can’t negotiate a satisfactory deal, then no deal at all is a success in its own right. If you’re not prepared to do this, then your only option may be to cave in to a lesser deal. If you are prepared to walk away, and your counter-party realises this, then you have the advantage as they will have to find a way to accommodate your terms if they want your business. Optimism is a common trait of successful negotiators. If you’ve got low expectations, then you’re almost inevitably going to come out of the meeting with a less-than satisfactory outcome. Aim high. If you expect the best deal, then you are more likely to get it. Focus on how your proposition is going to be prosperous for both parties, and, if you’ve done your homework, you will be able to prove that this success is worth paying for. It’s a question of confidence and belief – believe in what you are offering and have the confidence to prove it. Focussing only on what you will get out of a good deal is far too self-serving – and if you’re up against a good negotiator yourself, you’ll soon be sniffed out and exposed. During your negotiations, you need to do everything you can to help the other side feel satisfied that what they are getting will benefit them as much as you. If you can accomplish this, then they will be more willing to do more to help satisfy your needs. Importantly, however, this does not mean that you give in to everything that they demand, rather that their basic interests have been fulfilled. Focussing on a win-win scenario for both parties means that neither of you will be the loser, which will foster a strong, lasting, business relationship, which is ultimately what you’re both trying to achieve. Clichés are a real turn-off. Any platitudes or hackneyed expressions that you resort to simply give the impression that you lack passion, true knowledge and imagination. Instead, prove your passion by reiterating your company’s key value proposition, which you should have already developed with an avoidance of clichés in the first place. It’s all about communicating the true value of what you do, which is very rarely (if ever) achieved by resorting to common sales phrases. Follow these tips and you’ll become a better negotiator in no time – but you can always do more. 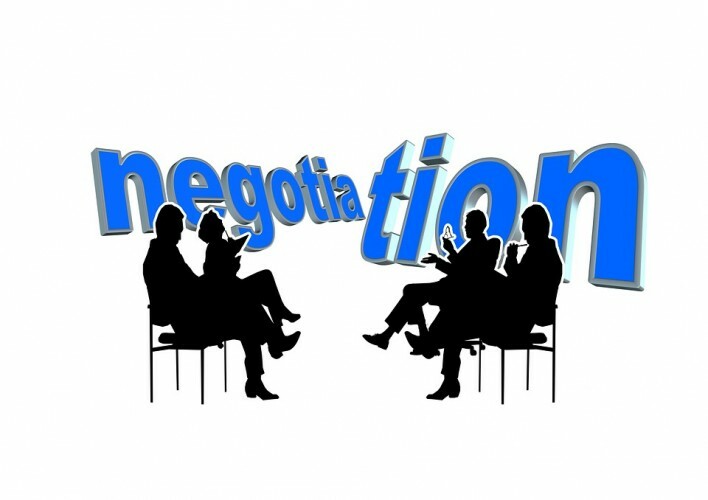 Here at Cope Sales and Marketing we offer negotiation training for execs who want to up their game. We can also be hired in to handle negotiations on your behalf. Please browse our website – www.cope-salesandmarketing.com – to find our full list of services, and please use our Contact Page to reach out. Looking forward to hearing from you!